Fine-tuning of the modal windows for effective user interaction. Modal windows are a powerful tool for sites that involve communication with the user. They can be used to draw attention, to talk about the latest news and changes. It’s an effective solution for saving the screen space. Pop-up blocks have become almost indispensable for the different forms types output (subscription, contact information transfer and much more). The emerging window draws quickly the user’s attention. 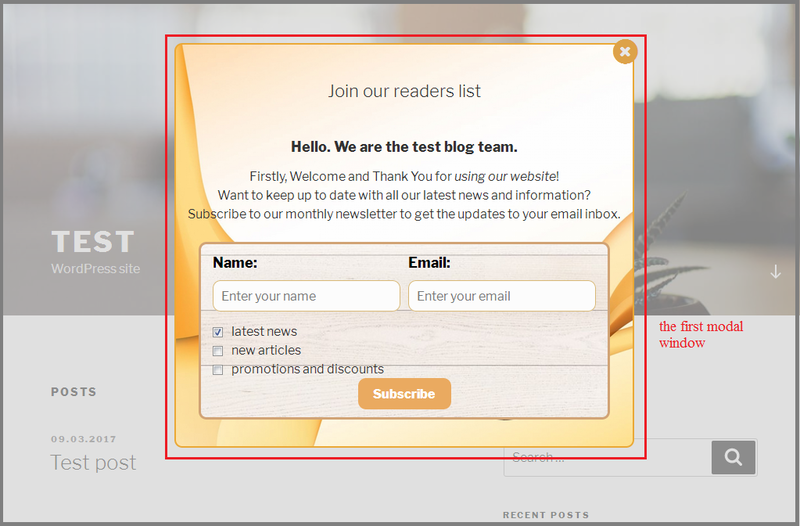 Correct configuration and design of the modal messages increases the site conversion. Proper use of the windows will provide stable feedback to potential customers. The output implementation of the different modal windows on repeated site visits. ensure the steady customers flow who want to pre-order the special offers of the company. display options depending on the user actions and much more. The Wow Modal Windows Pro is well compatible with other plugins. You can work with the browser cookies using its functions. 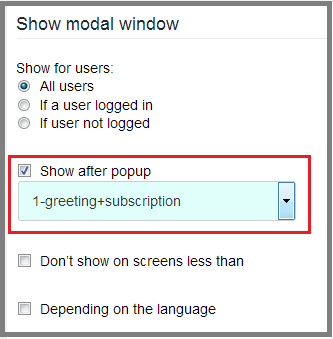 This will provide the modal windows display fine-tuning depending on the actions performed on the site. In the example, we implement the variant of different blocks output when the user visits the web resource page repeatedly. In total, there will be three examples. When users the first time visit the page, they get a general impression of its usefulness. Its structure, information availability, design and many other factors are evaluated. Help the user make positive feedback about the resource. Introduce him the site subject matter and its team. Offer of the thematic newsletter subscription can be perfectly added to the greeting. If the user is interested in the resource materials, he will be glad to get access to the exclusive articles or be the one of the first to receive the advantageous discount offers. Creating the first modal window. Let’s call it “1-greeting + subscription”, referring to its content. The text editor will serve as the tool for adjusting the contents of the pop-up block. We will write the small greeting in it, invite the user the newsletter subscription and connect the form. The subscription form can be created in few minutes using the Wow Forms Pro plugin for the WordPress-based sites. Just insert the special shortcode in the editor to connect it to the modal window. The two other pop-up blocks are created similarly. 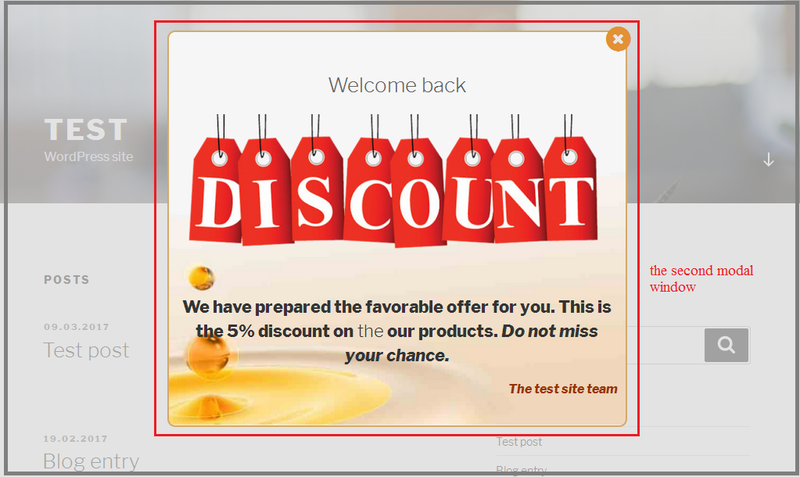 The second window, called “2-discount”, will inform the user about the profitable goods discount. Using the editor features the image to the text is added. Fig. 2 Creating the second window with discount information. The third “3-limited-offer” pop-up block will serve to present the limited offer to the user. We add special counter in addition to the window text component and the form for the product pre-ordering. It will count the time left until the action end. To implement it use the Wow Countdowns Pro WordPress plugin. This is the powerful tool influences the user decision making speed. The shortcode implements inserting the counter into the modal window.. Fig. 3 The third modal window with the counter and the pre-order form. The Wow Forms Pro plugin was used to create the pre-order form. It’s well compatible with the Wow Modal Windows Pro. It allows to set and use advanced settings for the different forms types. 2. Setting the windows style. set the background overlay color and the border. The framing element shade was selected individually for each block. Other parameters remained the default settings. Fig. 4 The style settings. The first window parameters are shown. choose the button color that corresponds to the windows design. Fig. 5 The closing button options. The button for the window closing should be clearly visible to the user. Otherwise, the modal window can cause irritation. 3. Setting the display options. In the following example, we’ll set the modal windows display for all users, regardless of their status. Set the output on all site pages. Fig. 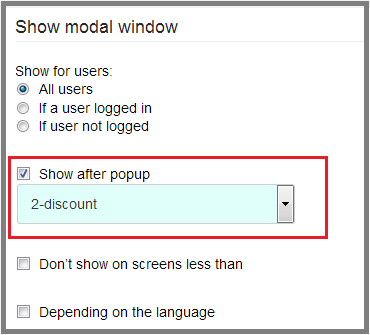 6 General settings of the modal windows display. indicate the effects’ duration 400 ms. Fig. 7 Options to change the pop-up animation. 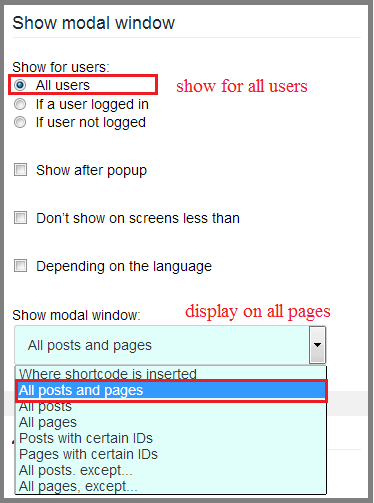 Set the display of all modal elements to the user, when the page loads. Select the required parameter from the list in “Display” menu. Fig. 8 Setting the pop-up blocks display, when the page loads. 4. Personalized windows output using the browser cookies. We must allow the plugin to use the user’s browser cookies to display windows sequentially. Set the number of days after which the modal window will be resumed through the “Reset in” field in the “Display” menu. Set its period up to 15 days. Fig. 10 Output of the first modal window “1-greeting + subscription”. select the “1-greeting+subscription” out of all existing modal windows list. Fig. 11 Setting the display order for the second window. Now the second visit to the web resource pops up the block “Welcome back” with the favorable discount of 5%. Fig. 12 The second modal window display, while revisiting the site. select the second modal window – «2-discount». Fig. 13 The display order for the third pop-up block. The user will see the third modal window, returning to the site one more time. Fig. 14 Window display with the limited offer. Using such personalized approach to users will increase the web resource conversion. Unobtrusive informative windows are able to attract attention and to interest in profitable offers.